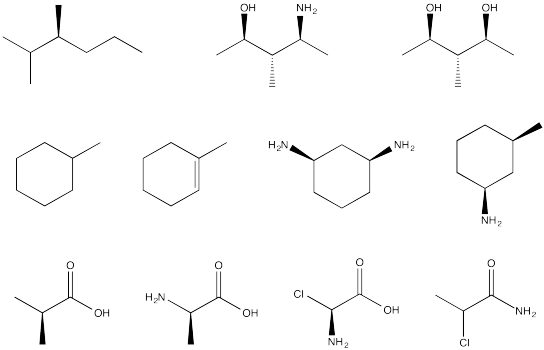 Stereochemistry is most important to us because of the role it plays in biology. Biological compounds usually belong to a class of compounds called organic compounds, originally meaning compounds that come from organisms. More generally, organic compounds contain carbon. because carbon is usually a tetrahedral atom, there is great potential for enantiomers in organic compounds, including biological ones. The compound shown below contains a carbon connected to a hydrogen, a bromine, a chlorine and a fluorine. A tetrahedral atom connected to four different things is called a chiral center; it is a place where two different arrangements are possible. Figure SC4.1. A pair of simple organic enantiomers. This is not likely to be a naturally-occurring compound, although some marine organisms do make organic compounds containing bromine and chlorine. However, compounds similar to this one are sometimes used as general anaesthetics for surgical purposes. It is used as an example here because the chiral center is easy to see. A chiral center is a tetrahedral atom connected to four different groups. R and S configurations refer to the three-dimensional relationship of these groups around the chiral center. Assignment of R and S configuration follows a well-defined set of arbitrary rules. Anyone can follow these rules and arrive at the same configuration for the same structure. About half of S enantiomers rotate light in the (+) direction and about half rotate light in the (-) direction. R and S configurations do not correlate directly with optical rotation values; these are two unrelated systems for describing enantiomers. Figure SC4.2. Ball-and-stick model of (R)-bromochlorofluoromethane. Go to Animation SC4.1. 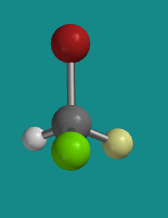 A three-dimensional model of (R)-bromochlorofluoromethane. Figure SC4.3. 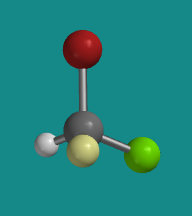 Ball-and-stick model of (S)-bromochlorofluoromethane..
Go to Animation SC4.2. A three-dimensional model of (S)-bromochlorofluoromethane. Compare the four atoms attached to the chiral center. What are their atomic numbers from highest to lowest? The highest atomic number has first priority; the second highest has second priority and so on. Turn the molecule so that the group with the lowest priority is away from you. Look at the three other groups. If they proceed in a clockwise direction from highest to second to third highest priority; the chiral center has the R configuration. If they proceed in a counterclockwise direction from highest to second to third highest priority; the chiral center has the S configuration. Note: If two atoms connected to the chiral center have the same atomic number, you have to use a tie-breaker to decide which one gets higher priority. The tie-breaking rules are descirbed on the next page. Problem SC4.1. Explain the reasons for the assignment of configurations R and S in the models above. Assume red is bromine, bright green is chlorine and pale green is fluorine. Problem SC4.2. Which of the following compounds have enantiomers? If they exist, draw them. 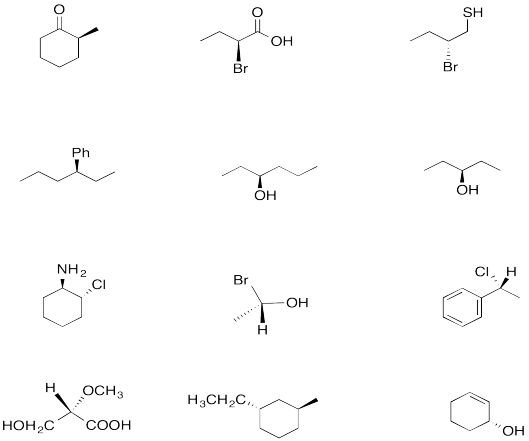 Circle the stereocentres in the following compounds.